Dolly Varden are char of coastal streams of the northern Pacific Ocean. In the eastern Pacific they range from the Bering Sea to Washington State. In the northwest they range from Siberia to Japan and the Korean Peninsula. They inhabit coastal streams and lakes, although in Canada they are found throughout the Skeena and Stikine Rivers and in isolated and landlocked populations in the headwaters of the Liard, Peace and Fraser Rivers. How they came to live in those rivers is the subject of the fascinating field of study called zoogeography. There are many different types of Dolly Varden that are distinguished by where they live. One type lives only in streams, which are often very steep and small. This form is usually quite small. Other forms migrate between lakes and streams or migrate within larger rivers. One type is anadromous like the Pacific salmon. Anadromous Dolly Varden spawn in freshwater but grow and mature in the ocean. Unlike the salmon, anadromous Dolly Varden live in the estuary of their home stream and spend only a few summer months there. Dolly Varden resemble other trout and char, especially the bull trout with which they are frequently confused. They have an elongated and moderately compressed body. In their marine phase, they have a dark blue or olive-coloured back, silvery sides and a white belly. Like all char they have light coloured yellow, pink or orange spots on a dark background. Trout have dark spots on a light background. In their freshwater spawning phase, males become much darker on their dorsal side, and their flanks glow a brilliant red. Males grow to about 45 centimetres and females to about 35 centimetres. They live up to eight years. 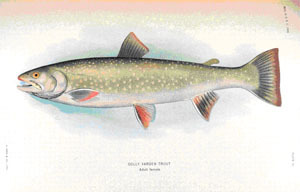 Dolly Varden are easily confused with Bull trout which are now known to be a separate species. Dolly Varden inhabit deep runs and pools of creeks and rivers. They are also found in lakes and the sea. Dolly Varden require very clean mountain streams with gravel bottoms and plenty of cover. They are typically anadromous, but many populations are landlocked. They are opportunistic feeders that have a diet that includes insects, small fish, fish eggs, shrimp, and leeches. Since the Dolly Varden migrate to sea from lakes in the spring, a lake outlet stream, stream mouth, or associated beach should be good from April through June. Good Dolly Varden fishing can be found in salt water during May, June, and July. As the mature fish return to their home stream to spawn and feed in August and September. You can usually locate Dolly Varden near spawning salmon, in deep holes, and at the creek mouth on an incoming tide. Lake fishing for sea-run Dolly Varden can be good from late August through November. The fish begin entering lakes in late August and are in prime condition after their spring and summer growing season. Most Dolly Varden that an angler will encounter will be 4 lbs or less. Lighter Fly gear offer exciting fishing for Dolly Varden as these fish are strong fighters. A 9 foot 4 wt, 5 wt. or 6 wt. graphite fly rod that has a matching reel spooled with a sinking tip fly line and a 9 foot 6 pound test leader will work for most areas. Flies that are productive for Dolly Varden are Zonkers in White and Natural, Egg sucking leeches and flesh flies, Glo Bugs, Wooly Buggers in White, Flash Fry in natural colors, Alevin, Bow River Bugger, Conehead Kiwi Muddler, Baitfish Minnows in Grey and White, Battle Creek Light. Deep Minnows in Olive/White, Red/White and Gray/White, Alaskan Sockeye Fry, Janssen's Minnow, Stinger Clousers in Olive/White and Gray/White, Salmon Fry.